This trailer for Neighbours , has to be one of the worst trailers I have seen in a long time. Seriously, if these are the best moments of the film it is going to be dire. Which is a shame. Because even though the concept is achingly unoriginal, the cast is led by charismatic actors who I quite like in Seth Rogen, Rose Byrne and Zac Efron. Who knows, maybe they can work magic and get this over the line. You’re right, that is really bad. Nice to hear Rose Byrne using her Aussie accent though! Haha, way to find a positive. I agree with you. I really rate her as an actor. But she has been in some rubbish (The Internship springs to mind). Agreed the trailer is not good. Hopefully the movie winds up being better than it. Agreed. Let’s hope they didn’t put all the best jokes in the trailer, cause if they did this film is in all sorts of trouble. 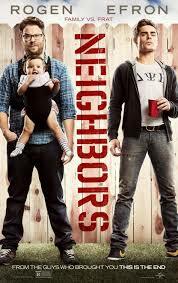 Was hoping this was the big screen adaptation of the Australian soap Neighbours! Haha. That would probably be better. Dude, I actually LOVED this trailer and find it really funny, which is weird since I’m usually really picky with comedies. Can’t wait! Well hopefully it lives up to your expectations my man. Yeah spot on. If there is absolutely nothing on at the time, I might bother. Hopefully it doesn’t come to that though.